Fifty (school visits) is Nifty! What better way to mark the day than with gold balloons? Milestone alert! 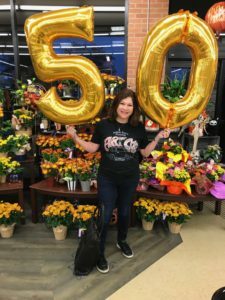 I recently celebrated my FIFTIETH school author visit! I’ve delivered my presentation so many times, I can practically do it in my sleep. Nevertheless, every visit feels fun and special. There’s always something new and different that comes up, which means no two visits are ever alike. Take, for example, that one student who asked, “Why don’t you have a body guard since you’re supposedly so famous?” And the time an honest child informed me that I look older in person than I do in my poster’s marketing photo. Oh, and the really bold kid who wanted me to sign his forehead! Those are some funny examples, but there are tender moments, too. “I can’t wait to go home and write a book” is a frequent and favorite comment I receive at most every school visit. 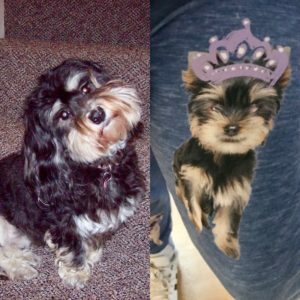 The girls often tell me they love my necklace (it’s a little blue car charm) or that they love my dog (Cricket is featured in my presentation). I’ve even had some sad comments, like when a child comes up to tell me that he/she doesn’t have a mother (that has happened) or that their father passed away (that has happened, too). When that occurs, I know to just give the child a big hug. Silly, sweet, or sad—I cherish all of these experiences. Dragonfly Whimzee and Penelope helped me celebrate my 50th school visit! Reaching my 50th school visit felt important, so I decided to ring it in with STYLE! 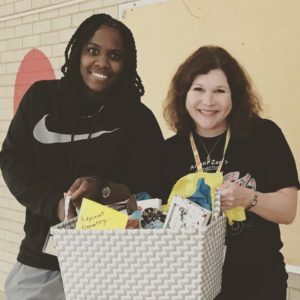 Houston’s amazing Ridgemont Elementary School in Fort Bend ISD was the school that happened to be my special fiftieth, and I invited not one but TWO art cars. 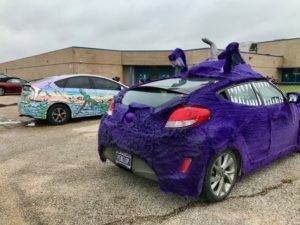 Art car driver Elizabeth Burnham brought her purple furry “Penelope,” and Jada August brought her new painted art car called “Dragonfly Whimzee.” The kids LOVED them! Jessica Edwards WON the door prize! A girl at Ridgemont Elementary couldn’t wait to show me her leggings! CRICKET! I also created a huge gift basket as a door prize (something I’ve never before done for a school visit). I filled it with numerous autographed books, candles, artwork, trinkets and chocolate—I mean, who doesn’t like chocolate? P.E. Coach Jessica Edwards was the lucky winner, and she made my day when she said, “Omg, I never win anything! Thank you!” Then she quickly took off to lock it up in her office for safekeeping, lol! A roadrunner art car by Bill Megenhardt. And finally, I gifted the school with an oversized custom drawing by my amazing illustrator, Bill Megenhardt. 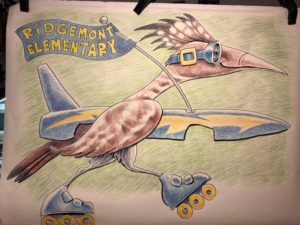 He drew Ridgemont’s roadrunner as he thought it might look in an art car parade! The students, faculty and staff went crazy for Bill’s creative rendition, which will forever hang in their library. My 50th school visit at Ridgemont was a good day, and it reminded me of comedienne Molly Shannon as the infamous Sally O’Malley on Saturday Night Live: “I’m fifty! And I like to kick, stretch and kick! I’m fifty!” And that’s how I really feel … kicking my heels up (literally) each time I book another school visit … and streeeeeeetching myself to get outside of my comfort zone. I can’t wait until the day that I get to post about my 100th school visit … stay tuned! And I hope you all keep kicking & stretching along with me.